Wow this version of the spreadable fruit from Barkers was oh so good, when it comes to traditional jam&apos;s raspberry is by far my favourite and this has to be one of the best i&apos;ve ever had. I love the home made style of this it does taste like a spread made from real fruit and other real ingredients and I love the fact there is no refined sugar as the fruit really does provide everything needed. Raspberries have a delicious flavour and the addition of other fruit juices help bring out the sweetness in this spread. For me raspberry spreadable fruit is so versatile and I can think of many ways I can use this in my regular baking! One thing we really enjoyed was home made scones with whipped cream and raspberry spread for mothers day recently such an easy way to jazz up plain scones as it was the perfect accompaniment. This unlike the seville orange had a great level of sweetness for my children to enjoy even though they would usually have very sweet traditional jams and this while being sweet doesn&apos;t compare to these jams that are full of sugar. I will quite often make porridge for breakfast and my children and myself have been enjoying barkers fruit compotes and I tried this with the porridge instead and it was just as good. You can taste the fruit used and while there are less visible pieces of fruit than the compotes being made into a spread you can still tell the fruit is there. 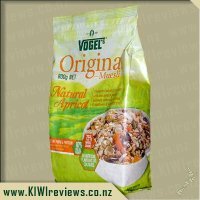 This is a product our family will be buying again as we found it very appealing in baking and in more standard breakfast options. 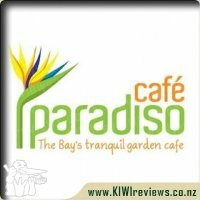 I was very excited to be able to review this product. The more of the Barkers range I try the more I love it. 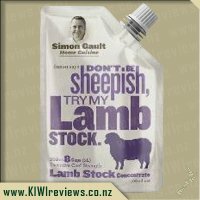 The appeal starts from the packaging that has such a homey down to earth feel that doesn&apos;t feel like the bulk produced products and is still reasonably priced even when on a strict budget like our family. That said, my initial reaction when I first opened the jar was a little surprise and disappointment. The consistency is quite runny and I was expecting something firmer, more like jam. I did find that once refrigerated, it firms up a bit. The taste lived up to my expectations, however. It is sugar-free (which I love!!!) but is still quite sweet and I found I didn&apos;t need to heap lots on, a small amount packed plenty of taste. My kids are normally quite fussy when it comes to jams and spreads but once they tried this they were hooked and honestly tried to convince me that toast with spreadable fruit for breakfast, lunch and an afternoon snack was perfectly acceptable. I was going to try using this in some baking but given the consistency, I wasn&apos;t really sure it would actually hold up so I can&apos;t comment on this, however as a spread on toast or bagels it was perfect. I very quickly got used to the thinner consistency and I&apos;m now quite put out that the kids have finished it all. Will definitely buy this in the future. 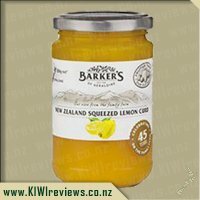 Our KIWIreviews box this time arrived and upon opening it I discovered not one but two flavours of the NZ company Barkers, spreadable fruit. I was really intrigued to see and taste the difference between traditional jam and this spread. I started off reading the label and saw that it has no refined sugar - instead using pear juice concentrate to add (I can only presume) both flavour and sweetness in a more natural way. With sugar being a HUGE portion of jam/conserves it was great to see this. I noticed it was that gluten free - and for myself this is great as gluten and me do not mix well. I checked the ingredients list and was really pleased to see that 40% of the ingredients were raspberry, then lemon, cranberry and blackcurrant juice concentrates also. Looking at the jar itself - the different varieties of this spreadable fruit are easy to differentiate. They have beautiful, almost hand drawn pictures on a papery type label - which conjures up thoughts of a little country kitchen somewhere with a recipe passed down from generation to generation - which, truth be told is a little like what Barkers is all about - so I think they have totally followed through with this new product. Tasting it was next on the agenda, and I had the perfect spreadable fruit item to do it on - a toasted bagel and a cuppa! After trying the wildberry variety, I knew that it was quite liquidy and so again opted to use a spoon to get it out, before spreading it. Once again this spread did not disappoint. You can see the raspberry seeds and smell the flavour, so to speak. I have a few other things I want to try this with - I have not yet given this one to my "I only eat red jam" loving daughter, but being that she loved the wildberry variety, I think it may be safe to say she will like this one too. I think the ideas to use this in/on or with are endless - and we absolutely will be buying this again in the very near future !! As with any new item there is a lot of trial and error. I originally thought this was just Jam without the added Sugar and that the consistency would be exactly the same and so was very ill prepared when first opening the jar. For some reason when opening jars I always tip them on their sides so got a complete shock when I had the Spreadable Fruit all over my hand and dripping down the jar, any illusion that this was like a Jam were quickly squished. After sampling it and finding it rather watery I put into the fridge for 24 hours hoping that it would firm up a little, and while this did help it was still not as firm as I would of liked. I even tried stirring it around. Spreads in our house just do not last, we are lucky if it lasts half way thru the week so I am in complete shock that we are down to the last bit now after having over a week. My daughters adore PB&J and it means Jams and Peanut Butter are being brought on a regular basis so I am stoked it means less shopping, well the jam at least. The girls usually lump it on and spread it over the Peanut Butter but with this they have had to adjust the quantity as the taste is rather strong. Both have taken different directions my eldest just puts it in the center and folds the bread resulting it in running over the surface where as my youngest puts 3 dots so gives a better cover. I actually don&apos;t mind them using this as I feel it is definitely more healthier than the other variety we use. As I love the taste of jam I find I also use quite a bit so the first time I used this on toast I actually covered it rather thickly, huge mistake! It has quite a kick for something that is sweetened with pear juice and is way stronger that I was suspecting. My next time I put a tiny bit on my knife and just spread very thinly over the surface and I much preferred this flavour. Where as it is a new concept for us, well me as I have grown up with jams I have started to relax with it and am enjoying it. A little does go a long way and is lasting a lot longer that I thought it would. The price does scare me some considering can buy sweetened jams for half the price but when you put into consideration that you do not require as much it actually works out about par. This is something I will be considering having in future. Spreadable Fruit. Sounded like an interesting description to name a product as opposed to &apos;jam&apos; as it looked like. So being Barkers, we were very interested in trying it for the family who normally just stick to the basic strawberry and other berry jams on the supermarket shelves. So we went for the classic of spread on toast. The spread was very runny and didn&apos;t stick to the knife well to get it from the jar to the hot buttered toast. And then the spreading itself. Just didn&apos;t want to happen! Instead of spreading nice and evenly over the toast, it was moved from side to side leaving little behind. So that was disappointing in itself. Once we overcame that obstacle and just left it as it was and folded the toast to keep it in, it came to the taste. What really struck myself and my husband was how homemade it tasted. How it tasted just like you&apos;d made at home. We think that really comes down to the exclusion of refined sugars and unnecessary sweeteners and really brought an authentic taste to it. A bonus was it being gluten-free as although we don&apos;t need to exclude gluten from our diets, it is something that we try and reduce when able to. I really wanted to try baking Bakewell Tarts with it as the sponge already had enough sugar in it, but a dollop is needed and I just couldn&apos;t get one from the jar so unfortunately, that idea had to be missed out! I&apos;ve used runny jams before and it just made a big huge mess which burnt when cooked and I didn&apos;t want to deal with that, even though it would have probably tasted very yummy. I can see it being a very nice addition to smoothies and sauces which I am yet to try but excited to do since we have some left. The price wasn&apos;t too bad; it was more expensive than other brands we normally buy. So wouldn&apos;t be one we would buy next time or any time in a hurry as we go through a lot of jam and spreads. But it would be one we would keep in our minds, especially when gluten-free is needed as we often need those products for parties we host. 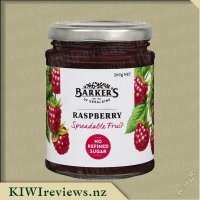 Spreadable Fruit - Raspberry flavour was an interesting review product for the family. My partner is a big fan of jam on toast and marmalades so he was excited to try this flavour. He said he liked that the spreadable fruit is gluten free and no refined sugar. He made him some toast and spread some on. He commented how it was runny and thin and said he did not like about it. He took a bit and straight away said oh no I cannot eat this. He said it was to tart for him and he did not like the taste at all. He said other people might like it but it is not for his taste buds. 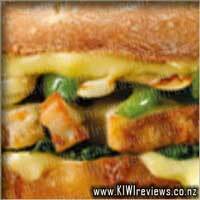 I tried it and did not think that there was anything wrong with it, I said it would go nice with scones and cream. He agreed and thought maybe it would go nice with other food besides plain on toast. It took a couple days but we made some plain scones up which was fun to make as its been ages since I have made some. We whipped up some cream and placed a light layer of spreadable fruit on the scone and topped with some cream. I have to say this combination worked well for the spreadable fruit compared to having it on toast. 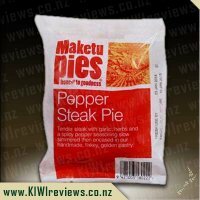 I am not sure if I would buy this flavour for the house again as it would probably sit in the fridge for half a year until it was gone, it would not be something we would use a lot of in a hurry. Other people may like the flavour a lot more than our house hold though but it is not for us. There is not much that I can really say about this product. It is designed as a spread, comparable to other jams and marmalades, with the added bonuses of being gluten-free, 99% fruit, and contains no refined sugar. As such, the product much like raspberries themselves is rather tart. It is interesting to see that while the Wildberry variety consisted of 47% physical berries, the Raspberry has been toned back to only 40% berries, with additional lemon blackcurrant, and cranberry juice concentrates, which looks like an effort to reduce that tartness in the raspberries. They didn&apos;t really reduce it quite enough for my tastes, however. Luckily the spread itself is very thin, which reduces the amount I have to add to my toast to cover the whole slice (nobody likes having gaps of dry toast).This in turn means the jar will get many more uses out of it. 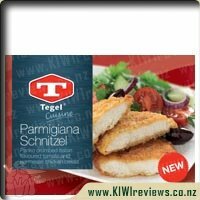 While a very strong flavour on toast, the product would actually work very well with desserts; whether it be the sauce for a cheesecake, or drizzled over ice cream, or even filling in a black forest-like cake. An amazing strength of flavour, but the product is too strong for my palate as is. It needs something to dilute and spread that flavour out. I love jam in the mornings and I love the Barkers of Geraldine brand so seeing them combined I knew I had to try their new spreadable fruit range. 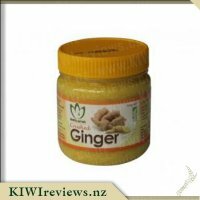 Barkers of Geraldine to me represents good quality products and after trying many of there other products I knew the spreadable fruits would not disappoint. I&apos;m always impressed with their packaging nice bright pictures of the berries they actually use in the product and when it states very clearly on the front there are no refined sugars I was really hoping I would love this product. Most mornings I have my coffee and toast with jam but most standard jams are chock loaded with sugars but the Barkers brand use sweetened pear juice concentrate to sweeten this jam and when comparing the nutrition information on the back this brings it down to almost a third less than my normal jam. There is a different taste as we all get accustomed to the sugar taste but I do actually love it and am getting used to it more and more the consistency is a little bit runny it would be nicer if it was a bit chunkier but that&apos;s pretty much my only negative comment. The jars are smaller at only 260g and are slightly more expensive than the cheap jams on the market but I think the fact you are eating less sugar and we are all trying to achieve that this is an easy way to start. 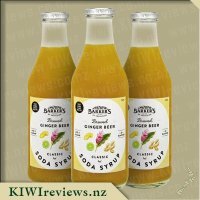 Barker&apos;s of Geraldine is quite a well-known company in New Zealand, it is known for high quality, great value, delicious tasting products. 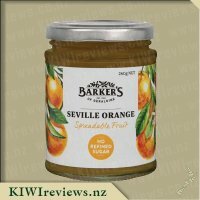 While browsing the KIWIreviews site I saw that there were some new Barker&apos;s products available to request, these included their new range of spreadable fruit jars. I liked the sound of these and the range of flavours available including Raspberry, Wildberry, and Seville Orange. I decided to request raspberry. Upon receiving the raspberry spreadable fruit I was immediately pleased by the jars appearance, the images of the raspberries each side of the label were very eye-catching, and the colours suited the jam which you could see through the glass. The jar is 260g in size which is quite a bit smaller than I would usually buy for our family, I was dubious as to how long the jar would last for us, I didn&apos;t need to worry though as we have had it for about 10 days, we use it several times daily and we have just gotten to the half-full point. The spreadable fruit has got no refined sugar which appeals to me, especially because my children love having it in sandwiches and on toast. After I took the lid off I was met with a very distinct raspberry aroma which was pleasant. When I went to spread it on some bread for a sandwich I was surprised that the consistency was quite a bit runnier than expected, this product spread nice and easily over the bread. I took a bite and was delighted that the taste was fruity and not too sweet and not too tart, it was just right. This product will be going on our grocery list and I would recommend it to all parents looking for a healthier option for a spread for toast or sandwiches, this contains 99% fruit. I look forward to trying some more flavours in this range and experimenting with them in my baking. 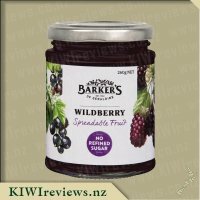 I feel in love with Barkers seedless bramble berries jam a year or so ago, and I do so love the taste of various berries, so I was excited to see this in my review parcel. 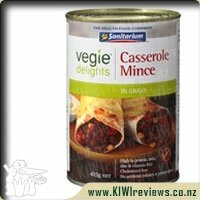 I always love the label for these products, it has a family recipe feel to it that always looks good. Reading the packaging, I really like the fact that not only is there no added sugar above what&apos;s naturally in the fruit, but that it uses a gelling agent derived from fruit, making it vegetarian friendly. By popular vote, this was the first of the three spreadable fruits that the kids and I tried. The label says that you only need to refrigerate after opening, so I followed this instruction, I&apos;m only mentioning this as I did notice a big consistency difference between just opened at room temperature and opened late at fridge temperature, the cold helped to make this a less runny spread (before it was pouring off our utensils) and more of something that didn&apos;t feel like we would loose it everywhere. Giving this a taste off the spoon, it packed a punch and delivers well on flavour, I found it sweet, which means it will go further, but I could also taste the lemon very easily. We&apos;ve now had this on bread, on toast, in a muffin and on a muffin as part of the icing and in all cases it was a hit with the kids. Whilst I love the flavour, I&apos;m not a fan of the little seeds (but I&apos;m not a fan of any seeds in any of my foods) but the kids are loving it and I have to agree with their wish to buy some more when this runs out. When I told my daughter I had some Barker&apos;s fruit products to review, and she saw the label and realised it was raspberry, there was no way I was going to be able to review it without her assistance. 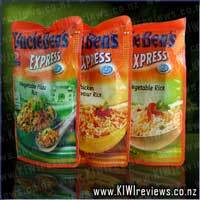 We talked about various ways of using this product and came up with a shortlist. First, we sampled a little, using a teaspoon: it was full of flavour - in addition to the raspberry, it also contains pear, lemon, cranberry and blackcurrant - so it was difficult to stop ourselves from trying more. Although the container is quite small (260g) it packs a lot of taste so there is potentially some good mileage to be got from it. Our first trial was with a steamed pudding. We added a quarter of the jam to the pudding mixture: because we used a microwave recipe rather than a conventional method, it was ready to eat in less than 15 minutes and was great served with some fresh cream. It would have been equally good with custard or even yoghurt. We tried another method, this time as a glaze on a small ham. That tasted good too although the glaze tended to melt and run off the top before it had set so we ended up scooping some out of the pan and serving it up in a small bowl alongside. The most popular way of serving ended up being as a spread on top of some Marcel&apos;s blinis, topped with whipped cream and a sprinkling of grated chocolate or desiccated coconut. In fact, the children tried both versions and Mr Eight ended up with both chocolate and coconut on his "just so he could see if it worked". Actually, the coconut flavour was lost in the stronger raspberry although the texture was quite interesting. The chocolate was much better; it blended with the raspberry as if they were destined to be a match, and everyone thought that was by far the best way of serving it. The reaction to the sweetness level was different according to who was tasting it. 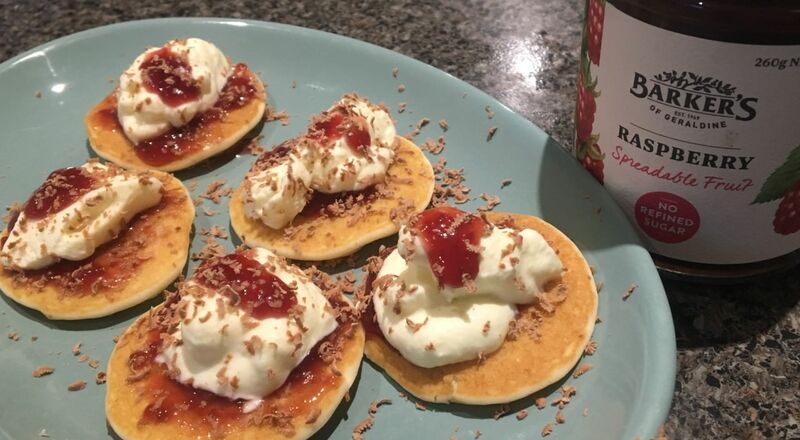 At first, Mr Eight thought it was a bit too sweet when served on the blinis, so we suggested that he try a second with less spread and more cream. This was a better combination for him, and he became so enthusiastic that we had to tell him to stop before he was sick. Miss Six, on the other hand, thought they were not quite sweet enough, so we did the same for her in reverse, adding a little more fruit and a little less cream. The adults approved without reservation, not only because the taste was authentic so that you really felt you were eating "proper food", but also because the ingredients listed only natural ingredients. That is always a strong selling point for us. A jam by any other name would taste as sweet. To my kids Barker&apos;s Raspberry Spreadable Fruit is a yummy jam. I don&apos;t have the heart to tell them or the energy to debate with them that it isn&apos;t actually a jam because it 99% fruit and not full of sugar like the ones they would usually eat. Apart from the ingredients the main difference I noticed was it wasn&apos;t a gelatinous blob like jam usually is. It is much runnier which means that a little goes a long way and therefore is more economical than at first glance. The first thing I did with my jar was to make jam drops. I got one of those please bring a container of home baking to camp notes and went into a panic. Thankfully I remembered I had a jar waiting to be opened and reviewed. 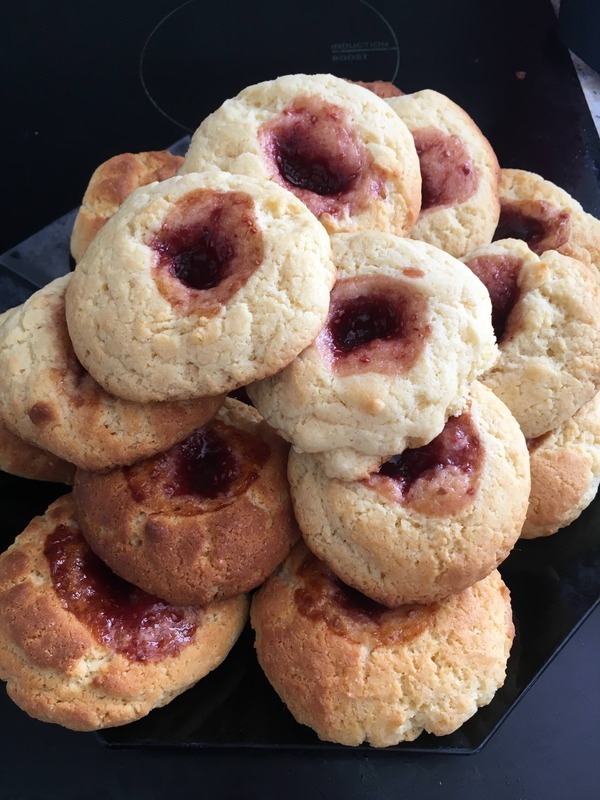 The jam drops were a hit at camp and I felt slightly guilty pairing this natural product with a basic biscuit recipe that was full of additives. We have a Sunday morning tradition in our family that I make pancakes. This time I surprised the girls by putting the spreadable fruit on with whipped cream. This was very popular and I have had requests to do the same again this weekend. I like that with the spreadable fruit the family are eating a healthier alternative without realising it. Miss 8 and Miss 9 did not say anything negative about it. I also preferred the smother consistency and I&apos;m keen to try some of the other varieties of Baker&apos;s Spreadable Fruits. Formerly known as "Aberdeen Steakhouse and Bar"